Young Hispanic Catholics in southern California have been empowered by the V Encuentro process, according to Brenda Noriega, a young adult programs coordinator for the Diocese of San Bernardino. Encuentro, which means “Encounter,” is an initiative from the U.S. bishops that seeks to better serve the growing Latin American community and will continue through 2020. Young Latinos have gone door to door to ask for input, started youth ministries and began serving at prisons, Ms. Noriega said. The V Encuentro, or Fifth Encuentro, process has been an ongoing success and has revitalized the entire diocese, she said. Ms. Noriega and more than 100 delegates from San Bernardino—including 30 young adults—will be attending the national V Encuentro gathering in Grapevine, Tex., from Sept. 20 to 23. “We need to accompany the Hispanic youth so they can become leaders, not just for Hispanics, but for the entire church." In Texas, 3,000 Catholics from across the country will hear and discuss the findings from years of consultation. Like the young Latinos in San Bernardino, Encuentro participants have been going out to listen to those on the peripheries, including those who have fallen away from the church. What they learned and shared at a local level will be discussed at the national gathering. From there, Catholic leaders at the parish, diocesan and national level will discern the best way to act on their findings. She called the “see, judge, act” method one of the “greatest gifts the Hispanic community has brought to the United States.” In 1968, the Second General Conference of Latin American Bishops inMedellín, Colombia, implemented this method of social analysis to recognize the needs of the community, evaluate the best response and act to bring about change. Along with V Encuentro, the methodology informed the Convocation of Catholic Leaders in 2017 and the National Young Adult Ministry Summit earlier this year, she said. 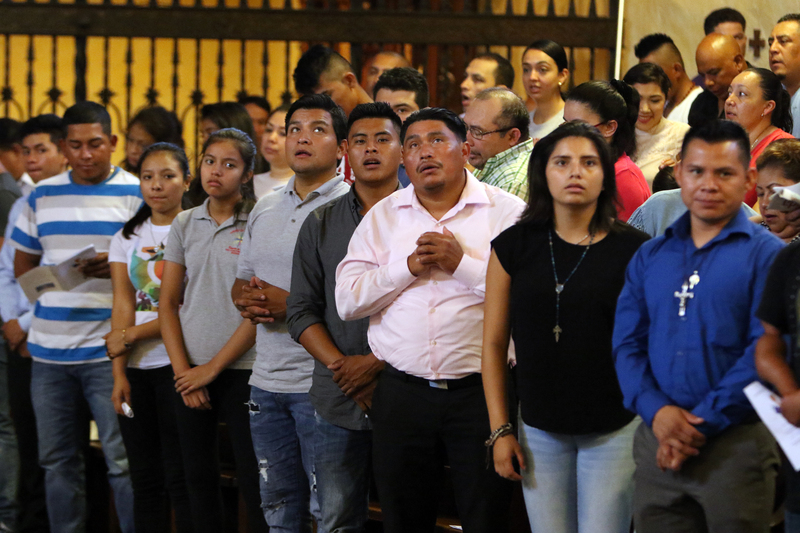 AV Encuentro survey released earlier this year found that the number of Latino priests is not keeping up with the growing population they are meant to serve. There are also many dioceses, oftentimes due to a lack of resources, that do not offer programs for the growing Latino population. The survey also confirmed previous reports that most Catholic children in the United States are Hispanic. The Rev. Rafael Capó, executive director of the Southeast Pastoral Institute in Miami, said young people are taking on leadership roles in the church thanks to the V Encuentro, which includes second and third generation Latino immigrants born in the United States who may not speak Spanish. This group has been a challenge to reach in the past, he said. Father Capó suggested the development of Latino outreach in the form of campus ministry, Catholic education and young adult programs. Father Capó is also mindful that the national meeting will take place during Hispanic Heritage Month, observed in the United States from Sept. 15 to Oct. 15. Father Capó noted that the first Masses were celebrated by Hispanic missionaries. It serves as a reminder that the V Encuentro is not just about Latinos. I was somewhat surprised to learn that most Catholic school children are Hispanic. I live in a nursing home/rehabilitation center and one of my roommates and good friend is originally from Puerto Rico. His mother and many family members are still in the commonwealth. He occasionally is able to call his mother using the rehabilitation phone. Everyday he uses my cell phone to call his "adoptive mother " in Delaware. He needs considerable help from the staff, as well as other residents with his personal needs. We should all as good Catholics provide assistance to others in need, regardless of their ethnic group.